Australian Alpine Mint Bush is a great, dense, low growing evergreen shrub for full sun and a warm position. 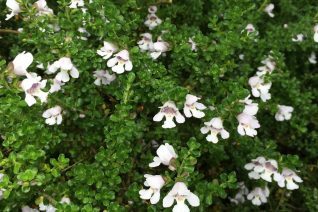 The small aromatic foliage is glossy and tightly congested on the stems. In late spring relatively large (compared to the leaves) cupped white flowers have an interior dotted with purple. Easy to grow shrub in average well drained soil. To 2′ x 3′ in 5 years. Avoid the coldest gardens. Hardy in correct siting to 5ºF. Forms a low weed smothering layer. Moderately fast growing. Light summer water. Moderate deer resistance.